At sunset on Wednesday January 8, Venus is briefly visible just at sunset. What a difference a week makes. If you were looking up just after sunset this week, you may have caught a glimpse of Venus setting just after the sun, weather permitting. But try it again at the same time next week, and Venus will be gone. But if you look just before sunrise on Wednesday, Jan. 15, you'll see Venus rising just before the sun. So how does that happen? The last time we had an inferior conjunction of Venus and the sun was on June 6, 2012. On that date, Venus actually passed in front of the sun's disk as seen from Earth, an event so rare that it happens less than twice a century. This was called a "transit of Venus." But on Saturday, Venus will pass well to the north of the sun, so it will not be visible on the sun's disk by observers on Earth. If you manage to spot Venus in the next night or two, take a look at it with binoculars. It should appear as a slender crescent, almost completely backlit by the sun. 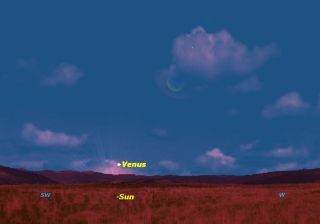 A week later, at sunrise on Wednesday January 15, Venus has become a “morning star” and rises just before the sun. An interesting challenge is to see how close to conjunction you can observe Venus. If you live in the Northern Hemisphere, have a clear view of very low horizon in both the east and west, and very clear skies, you might actually be able to observe Venus on Jan. 11 as both a morning and an evening star, because it will be passing north of the sun. Very experienced observers might even try to spot Venus in a telescope within a day or two of conjunction. This is very dangerous because the sun will actually be shining into the tube of the telescope. I managed such an observation on April 9, 1961, only 27 hours from conjunction, using an 8-inch reflector. At that time I saw Venus as a complete circle of light. Because the sun was almost behind it, the entire ring of its atmosphere was lit up. Warning: This is something only experienced observers should attempt, because there is great danger in accidentally getting the sun in the field of view, which might cause permanent blindness. Editor's note: If you have snap an amazing photo of Venus, or any other night sky object, and you'd like to share for a possible story or image gallery, please contact managing editor Tariq Malik at spacephotos@space.com.